The city of Milwaukee is working to transform its industrial harbor into a bustling waterfront district that attracts anglers, boaters, and wildlife lovers. “But not a lot of people know exactly what’s going on underneath the water,” says Brennan Dow. 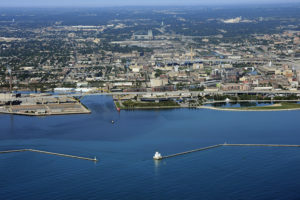 While a graduate student at the University of Wisconsin-Milwaukee, Dow was part of a project working to map the underwater ecosystem of the Milwaukee harbor and rivers that feed it. The team used sonar to learn about existing fish habitat. That information can be used to help protect and restore the ecosystem and guide development decisions so that industry, recreation, and the fishery can all coexist. Read up on the full project from the University of Wisconsin-Milwaukee. Learn more about Milwaukee’s efforts to restore and expand upon the city’s waterfront.